I have been wearing my Rebecca Minkoff saddle bag so much since I bought it...while it might be a little repetitive seeing it pop up all the time, I haven't had a reason to swap it out for another one of my many handbags because I'm finding it really does go with everything. Two different outfits below showing how easy it is to wear a red cross body bag. Wore this to sit on the sidelines of toddler T's swimming lessons. Have to wait until my 6 week postpartum checkup before I can get the all clear to do any exercising other than walking and the exercises the physio gives you in hospital. I'm looking forward to getting back in the water though! Thought the colourful floral print on this kimono would look nice with the red saddle bag. I really liked the combination. The kimono works nicely as a little nursing cover when breastfeeding too. Last worn: Ray-Ban Wayfarers, floral cocoon kimono, black breastfeeding tank, Sass & Bide skinny jeans, gold mouse flats, Rebecca Minkoff saddle bag. Other ways to wear: floral kimono and a mint tee, black nursing tank and a maxi skirt, Sass & Bide skinny jeans and a graphic tee, gold mouse flats and a Chloe paddington, Rebecca Minkoff saddle bag with a maxi skirt. I did like the colours in this outfit though - the neutral black and grey makes the red cross body bag really pop. A nice way to wear it, I've worn it with an all black outfit before too. Last worn: Ray-Ban Wayfarers (above), Making magic happen tee, pleated maxi skirt, black ballet flats, Rebecca Minkoff saddle bag (above). Other ways to wear: Making magic happen tee and a baby bump, pleated skirt and liliac tank, black ballet flats and a pink dress, Rebecca Minkoff saddle bag with stripes. Linking up with Shoe & Tell, Let It Shine, Hello Monday, Modest Monday, Classy Monday, Mix It Monday, Mums That Slay, On Trend, Turning Heads, Style Sessions, Confident Twosday, Wardrobe Wednesday. Ooh that pleated maxi skirt is really cool! And do love the colour combo with the red bag poppin' like that. I also adore your Marc Jacobs mouse flats . . . Miss L has been given a Big W version, I can't wait until she grows into them!! I love both looks! 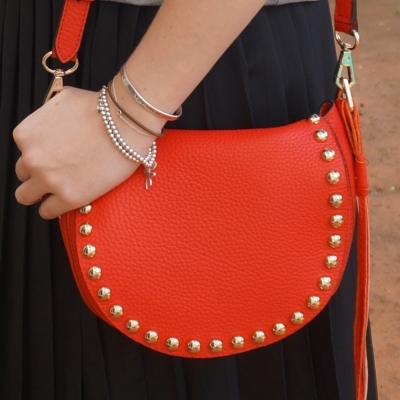 I really love your Rebecca Minkoff bags - they are so versatile! I think a red bag acts as a great pop of color with monochrome outfits, but I have to say that I love the combo with the kimono. Your bag is very pretty! I have been using a small bag recently since it is very convenient to carry around! I do love a cross body bag! So convenient and perfect for keeping your hands free for other important tasks...like shopping! Such a pretty pop of color with that bag. I can see why you love it! The design of this bag makes it so easy for mix and match with different outfits, thanks for sharing! 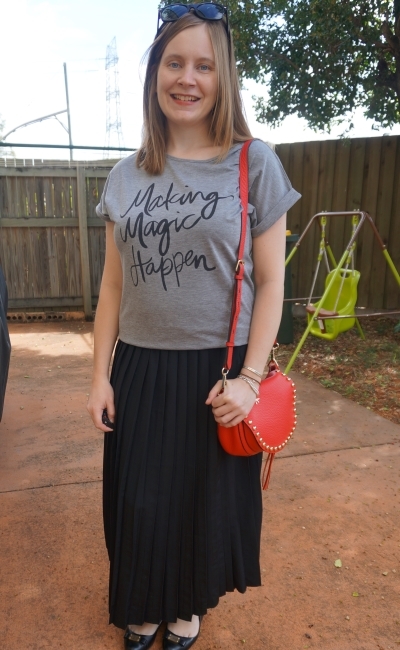 Love the make magic happen tee! Your moms old skirt looks lovely. I'd wear a tucked in tight shirt with it, maybe your floral top too. I do love the red bag. Makes both outfits pop! Thanks, I should try it with a floral top next time, haven't worn it that way before! It's definitely the perfect bag! I'd wear it all the time too! I'm starting to feel I only rotate through a few as well, haha! I love both of these looks, Mica! Red is definitely a perfect option for adding a pop of color to nearly any look, kind of like a red lip! I really love the first look with that kimono, so pretty! Thanks so much for sharing and I hope you have a great week ahead, beauty! Both outfits are so adorable, but the first is my absolute fave. You are really making me want that red bag the more and more you post it lol. You already know I love the bag! It's fun with so many things. Loving that pleated black skirt. I don't remember seeing it before. How fun to have a piece from your mom. I haven't worn it in a while which is a shame as it's a nice skirt! I love, love your kimono on the first photo and the way you styled your bag! Oooh, the pleated skirt and the red bag are so pretty together! Beautiful outfit. That is such a versatile bag and seems to go with different outfits. You look great with the kimono, love how casual but chic the whole look is. That bag is so stunning and fun, I especially love it with that black pleated skirt! Hope you had a great weekend! That bag is gorgeous, love Rebecca Minkoff! I've been using my Kate Spade crossbody bag in almost all of my outfit posts myself so I get the temptation of not wanting to switch handbags. At least that Rebecca Minkoff bag is super cute! I really love your second outfit a lot - it reminds me of what I normally wear! Yes I've missed being able to go for a swim whenever I feel like it! What a super cute bag! It's a great summer color! Such a beautiful bag and so versatile! They are often trendy pieces - it's good to have this one to jump on the trend whenever, haha! I love how you've gotten so much use out of this bag! The outfit with the pleated skirt is gorgeous! I have, I've been wearing it a lot! You're going to get a lot of wear out of it Mica! I love your pleated skirt. It's a classic :D So awesome you have your son enrolled in swimming lessons. It's so important to learn how to swim. Definitely! We want him to be comfortable in the water. That bag looks really nice with both outfits! It brings out the colors in your kimono and really compliments the neutral grey and black in your second outfit! haha yes I was hoping to make the magic happen and calm baby down ;) Motherhood is magic, I'm so grateful for it! Love the bag, but love the Marc Jacobs mouse flats more :). I'm totally in love with this bag! You left the comment on my blog about kimonos... and it's true, you DO love kimonos! Ha!! Loving the second look... I'm such a big fan of graphic tees! Yes the cool change is welcome! Especially after all the heatwaves over summer and autumn. I love both outfits! The floral kimono is so pretty and feminine and easy. The graphic is tee is fantastic and I really do like it paired with the pleated skirt. It sort of an unexpected pairing, but I think that is what makes it work! Great looks! I love the bag!! That really is a great bag. I love a red purse...unfortunately, I don't have one any longer. Guess I need to change that! I'm a big fan of Rebecca Minkoff bags. Love her designs and that each bag can be styles effortlessly. Love the way you styled yours. I body cross bag is so versatile and you have just proved that to us. I love the both styles, the skirt screams boho vibes and the jeans screams chic casual. You look dashing! Your bag adds such a bright and happy pop of colour to all your outfits! Very stunning! You can keep the outfits with that bag coming, I love it!! I love both looks, but I hate it when an outfit makes me feel uncomfortable and I'm pulling and tugging all day--that drives me crazy! A pop of red always looks great. My sis has been looking everywhere for red ballet flats as her fave pair has fallen apart - we just can't seem to find them anywhere, oddly enough! I would have thought red was a fashion staple these days. Oh wow I would have thought it was a staple too! Hope she can find a pair! That's such a great tee Mica- I am slowly, but surely, trying to catch up on older posts. Hugs.